The running of the bulls was exciting but it was only half of the experience – the other half was what happened to the bulls after they arrived in the stadium – the bull fight. 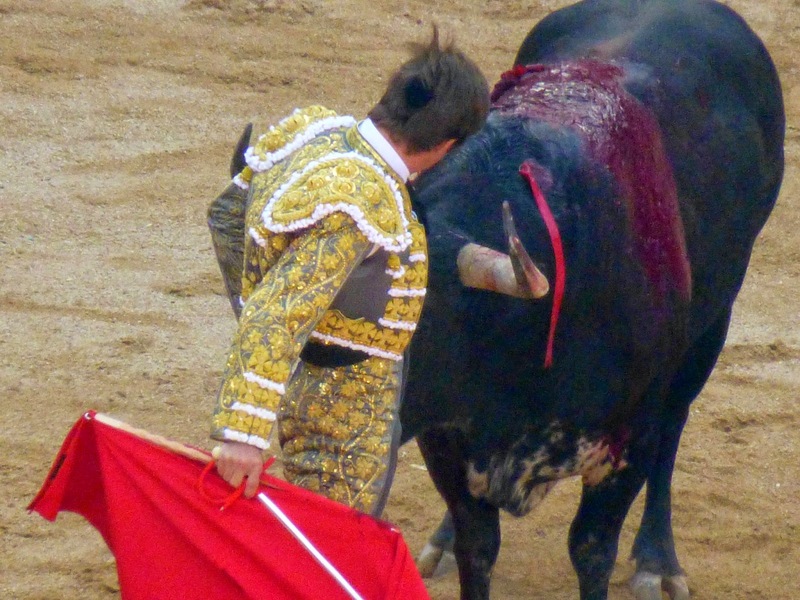 I’d read and heard a lot about the bull fights, both in Spain and Mexico – but never experienced one. I know a lot of people don’t like them, but thought I might enjoy the spectacle and the challenge – one man - armed only with a cape alone against a dangerous animal. When Carlos suggested we take in one of the nightly bull fights I immediately jumped on board. We found a place to stand by the rail. The crowd was loud, boisterous, and drunk. Buckets of sangria were being tossed onto the people below from the upper decks. We were doused, wet and disillusioned quickly. The band struck up and the spectacle began and I was impressed with pageantry, but not fully prepared for what followed. First of all the picador, a man on a well padded and blindfolded horse, rides up beside the bull. The picador lances the bull in the neck several times until the bull’s sides run with blood. Then two picadores run out and jab the bull with barbed harpoons. Now we’re ready for the main act. standing off to the side spring into action. Okay, where's the "sport" part? After a few moments the bull has had enough and just waits for the matador to put him out of his misery – stabbing him cleanly in the heart. In the two fights I watched this didn’t happen. 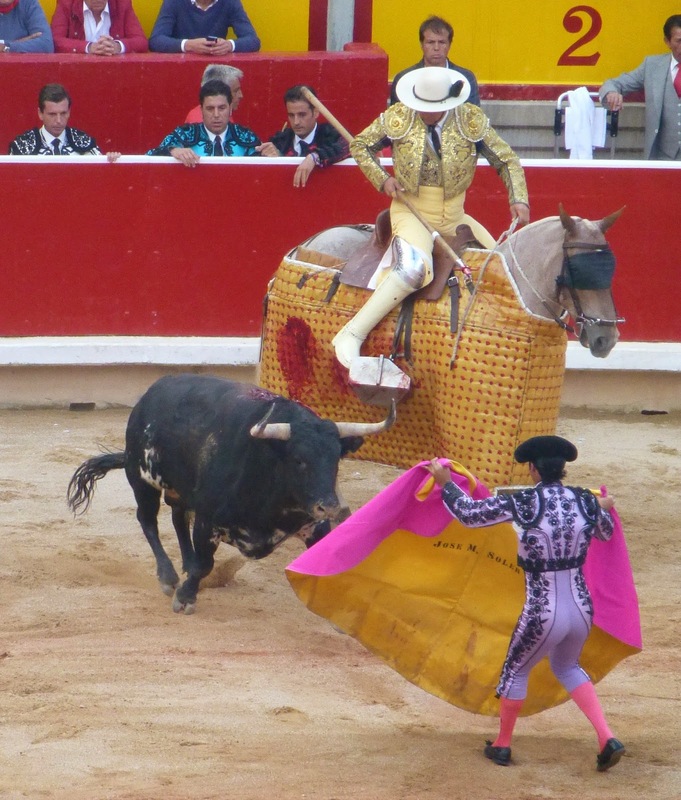 The matador missed and the bull had to be put out of his misery while the crowd cheered. The bull is dragged out of the arena by a horse leaving a bloody trail in the sand while the crowd cheers and the whole thing is repeated again. I watched two rounds, and had enough. I left dissolution, sad and dyed pink from all the Sangria that had been chucked down on me. The whole thing had the feel of being in a Roman Coliseum two thousand years ago – at least there the advisories had a slim chance of survival. Words really can’t describe the event, but I filmed a complete bull “fight.” Feel free to watch it – if you have a strong stomach. As the tour was built around the running of the bulls I didn’t have high expectation for the remainder of the trip. The plan was to travel by bus to San Sebastian on the Atlantic coast for a night then on to Bilbao where the tour was to end. San Sebastian, on the southern coast of the Bay of Biscay, is in the north of Spain – Basque Country and a prettier little city you’ll be hard pressed to find. The city is built in a deep cove and has a wonderful seawall walk way that stretches for kilometers –reminiscent of Vancouver’s sea wall. For the most part the city is fairly modern, but has a compact “old city” at its core. There’s a century old funicular (a cable railway) that clanks up to a peak that overlooks the city offering a spectacular vista – again reminiscent of going up to the top of Grouse Mountain and looking down on Vancouver (if you get a clear day). But there is also something else at the top of hill – something straight out of a Stephen King novel. The food in the Basque region is different from the south. Here almost all the tapas are served on a slices of bread. Like the south a lot of it is seafood. A group of American’s on our tour refused to “eat this junk” and headed out to find a pizza joint. Their loss. I’ve encountered this attitude a fair amount - almost always with American travelers. They insist on eating “American” (translation: junk food) where ever they travel. They should probably stick to Disneyland. San Sebastian is a city I’d definitely visit again and stay longer. If you’re in the area I definitely suggest you spend a couple of days there. The final stop on the tour is Bilbao. The only thing I know about Bilbao is that it had an old moon – according to the Andy Williams’ “The Bilbao Song.” I didn’t even know Bilbao was an actual place. I thought he was singing about a guy – Bill Bao - shows you what I know. I wasn’t impressed with Bilbao. It was originally (and still is) a working port city. It reminds me more of Buffalo. To their credit, the city fathers have gone to great lengths to try and gussy it up for the tourists – but there’s only so much lipstick you can put on a pig. Andy Williams can keep Bilbao – old moon and all.